Content is so critical to the success of a website but all too often it gets pushed down the list of priorities during a website redesign or new site development project. It may not have the allure of polished design work, or wow in the same way an intuitively crafted CMS can – but content is what gives a website substance. Quality content is the difference between a site meeting business and user needs or, falling short leading to another redesign before you know it. So why is content not more of a priority? The challenge with producing content for a website (and the bigger the website, the bigger the challenge!) is less to do with content, and much more to do with people and processes. Organising content can be a huge undertaking for a project manager. You need to manage who writes, edits and approves content, keep track of status during production, and likely wrangle with a myriad of spreadsheets, word docs, emails and software tools to do so! 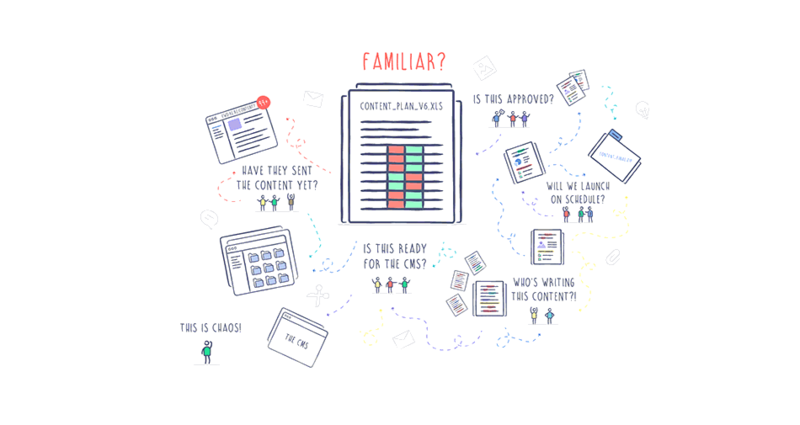 GatherContent was built to solve this challenge for project managers and content collaborators alike. It is an online platform that helps teams organise the production of lots of content for website projects. It’s a content management solution that helps you organise writing, revisions, and publishing times – all from a single platform. After you’ve leapt past the hurdle of organising who is responsible for writing what and by when in your website project, next comes the co-ordination of assets coming at you from all directions. Even when you outline the best way to provide content, and send timely reminders, you’ve probably found yourself navigating between a mess of content in word docs, emails and even presentation files. Perhaps you’re tracking status in a spreadsheet. But can you ever trust that a file named “FINAL V3(1)(3)(2)” is really the most up to date version? GatherContent eliminates this stress. Writers are invited to provide their both written content and asset attachments within templates, saved automatically online. Writers won’t need to email you to say they’ve uploaded content, instead a simple notification system will let relevant collaborators know when content has moved along in your production workflow. Whether you’re working content-first, agile or in a more traditional waterfall style of project management when content lands on your desk, it often won’t match what you expected whether that means it is not aligning with the content plan, design or CMS! GatherContent lets you define templates to help contributors know how content needs to be structured to fit your website plans. You can create templates that go beyond just written words in a CMS-style that blends perfectly into whatever site you’re working on. Handy features like character limitations and field guidelines, keep your contributors right and reduce the back and forth on review rounds, helping your project stay on track. By bringing the production and review process into one place, you can make things much more open and collaborative for your content contributors. Writing, reviewing and approving content all happens in the same system. Once you’ve invited the team, writers can ask questions about requirements within the comment system or get started on producing right away. Commenting also makes it easy for writers and editors alike to discuss the content – and all they need is an internet connection to work together! GatherContent also has smart permission settings so you can make sure people only have access to what they need to see and can only perform the actions you want them to. This is great as it gives you peace of mind that people won’t accidentally interfere with content that’s not under their remit, and it’s also makes it much easier for contributors as they don’t need to navigate through an entire project to find their assignments. 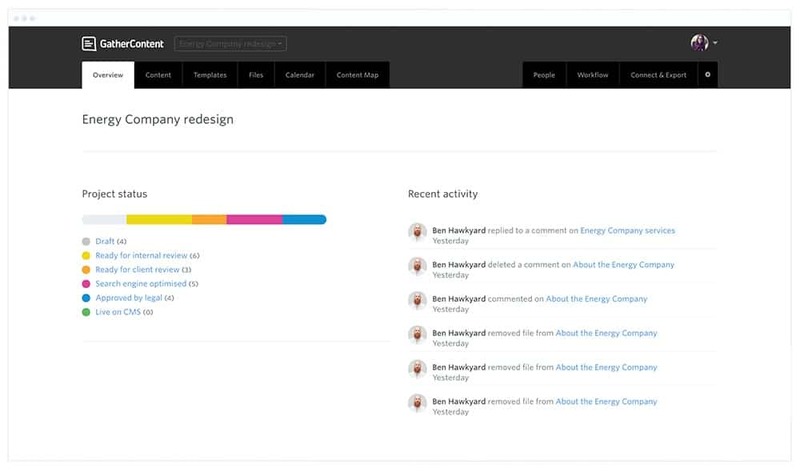 Where GatherContent really comes into its own is the ability to define a bespoke workflow to suit your organisation, process and project. In word docs we’re used to seeing ‘draft/for review/final/version X,Y,Z’ appended to the document titles. Instead, in GatherContent you can apply a status to each content Item that matches the production workflow of your project. 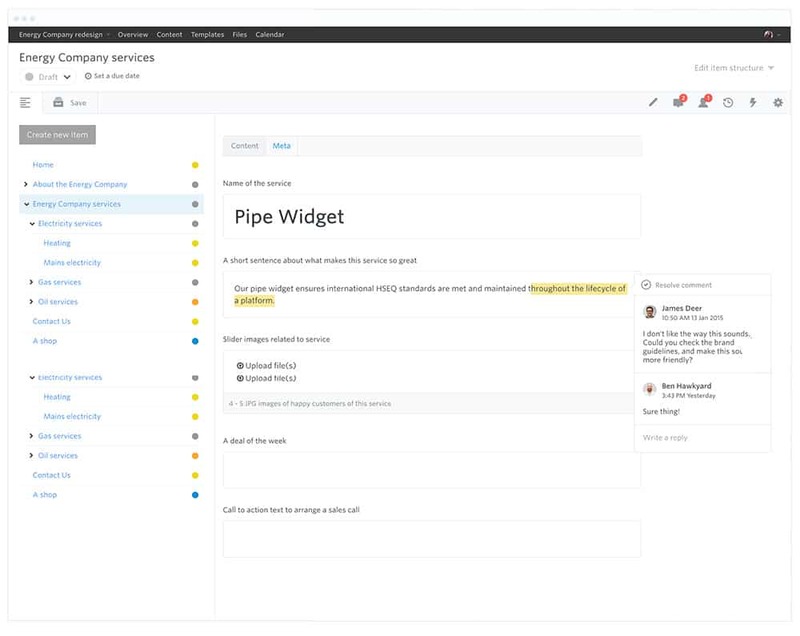 This makes it really easy to understand what status content is in at a glance (no spreadsheets required!). It will also help you identify any project bottlenecks early so you can corral the team to keep them on track. Of course, with content assignments and deadlines – GatherContent will also send automatic reminders when content is due, so you don’t always have to feel like the baddie chasing! Too many of us are familiar with the glee of receiving approved content being ruined by the mad dash to copy and paste content into your CMS in order to stick to your launch schedule. GatherContent offer a range of CMS integrations and an API that with a little help from your development team can automate this content migration. Just think of the hours this could save in your project! At the time of writing, GatherContent offers out of the box integrations for popular CMS’ such as WordPress, Drupal, ExpressionEngine and more. See their CMS integrations page for a full list and those coming soon. If content has caused issues on previous website projects, you need to check out GatherContent. It comes with a free 30 day trial (no credit card required) with full access to all the features that can radically change your content management workflow. I'm Becky Taylor, a Marketing Manager at GatherContent, an online platform that helps teams organise the production of website content. This is my first in-house role, having spent 7 years working previously working in digital agencies based in London and Aberdeen. I've managed projects of all shapes and sizes across affiliate, display, mobile, search, and social channels as well as managing the design and development of website projects. I've been lucky to work with clients across a range of sectors including Travel, Entertainment and Oil & Energy.